The House democrats today slavishly chose Rep. Steny Hoyer as the Majority Leader over Pink Hawk John Murtha on a 149-86 vote. Rep. Hoyer called African American Republican Michael Steele a token in 2002 and about a month ago he equated the Lieutenant Governor of Maryland with a slave. Today he was elected majority leader of the House… Nice. Yesterday, Jack Murtha, who said he expected to be the #@x%x* House leader in the ABSCAM tape that resurfaced this year, said he had the votes. He only lost by 63. In cold blood, Murtha gets redeployed. 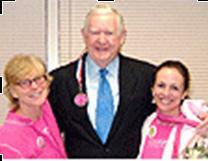 But, John Murtha will always have the peace-nuts from Code Pink in his corner is it’s any consolation. The scene today was a spectacle to behold.